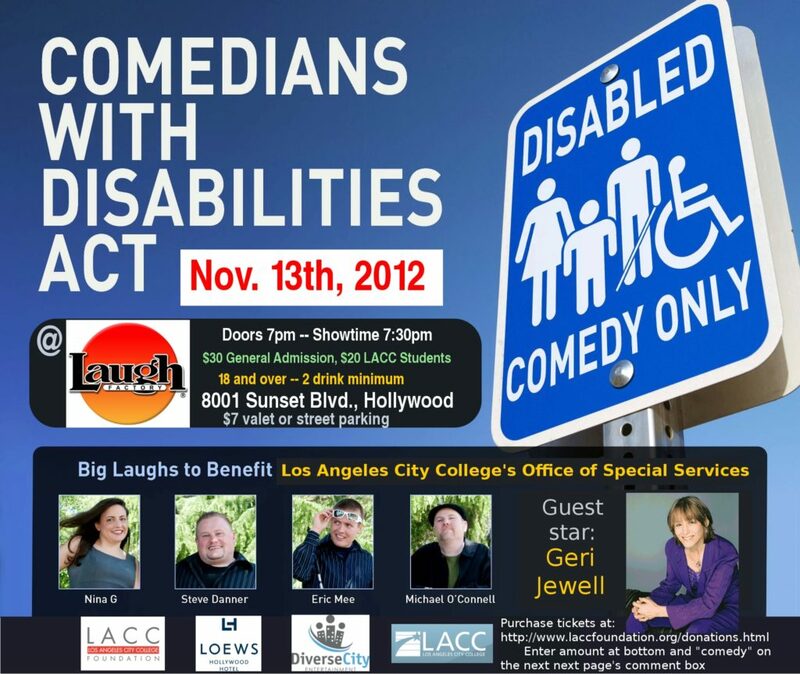 Come laugh as guest star Geri Jewell headlines the second annual Comedians with Disabilities Act, Tuesday evening, November 13th at the Laugh Factory in Hollywood. The benefit show is raising money for Los Angeles City College’s Office of Special Services (DSPS) which provides accommodations to students who happen to have a disability. This the second year in a row that the Laugh Factory has donated the stage and the performers are all performing for free. LACC’s Foundation is sponsoring the show; therefore donations are tax deductible. The November 13th show will feature guest star Geri Jewell, the first person with a disability to have a regular role in a prime time series, “The Facts of Life” in the 1980s. In addition to her numerous television appearances, she is a veteran comedian as well as a motivational speaker. The Comedians with Disabilities Act has a “special” brand of humor that both amuses and informs. The northern California comedians, featuring Michael O’Connell, who has muscular dystrophy, Steve Danner, who is a little person, Eric Mee, who is blind, and Nina G, who stutters, met each other through the comedy club circuit and decided to band together to treat audiences to a unique and unforgettable experience. Their comedy comes from the lifetime of experiences each has had due to their individual challenges. They see performing as not only a chance to entertain, but to educate people on disability issues. Audiences should be warned that some of the material may be offensive and the event is certainly for adults only. To buy tickets for the Laugh Factory show, please visit: http://www.laccfoundation.org/donations.html. Scroll down and enter $30 per general admission ticket you’d like to buy ($20 for LACC students). On the next page, click “Go to checkout.” It will then ask for your name and credit card information and then where it asks for “Comments” please enter “comedy.” You will receive a receipt by email and we will have your name at the door. Note: There is a two-drink minimum. And the Laugh Factory is 18 and over. Doors open at 7:00pm. Show sponsors include the Laugh Factory, the LACC Foundation, the Loew’s Hollywood Hotel, and Diverse City Entertainment.